Step 1. Create a new image in Photoshop. 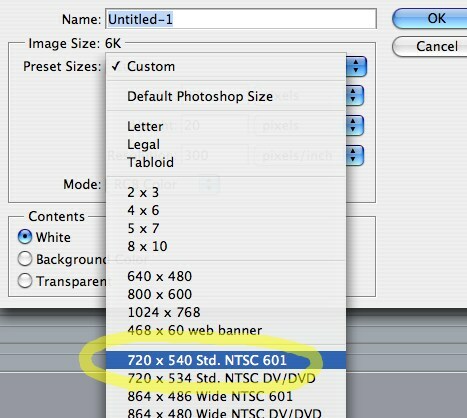 For NTSC video (the standard in North America and part of Asia), make it 720 x 540. For PAL video (the standard in the rest of the world), make it 768 x 576. 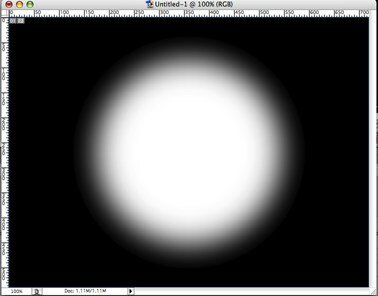 As you can see below, Photoshop helpfully offers these sizes as menu options. Note: If these dimensions seem a little different from what you’re used to, remember that many modern video formats (DV and DVD, for example) are anamorphic. That means they require a “squished,” or distorted, recorded image, which they restore to normal size when they play back. 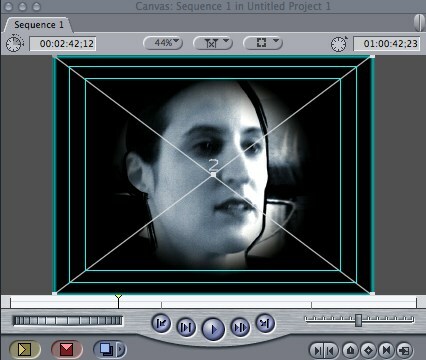 We’re using the proper unsquished dimensions to create our masks; Final Cut will take care of the resizing automatically. Step 2. Make your mask. Use black for any areas you want completely blocked, and white for any areas you want completely visible. Step 3. 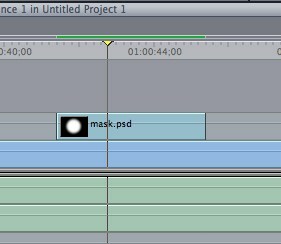 Drop the mask image onto your Final Cut timeline, placing it on a new track above your original video. Step 4. 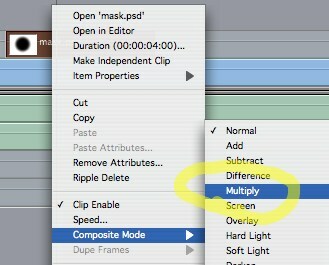 Right-click (or control-click, on a one-button mouse) on the mask clip to bring up the Composite Mode menu. Choose Multiply. Step 5. Your original video on the track below should now be visible through the mask. Here’s an easy one: if you have a Mac with built-in Bluetooth, and your Bluetooth icon suddenly grays out, and clicking on it gets you a “Not Available” message, and your System Profiler insists you have no Bluetooth adapter at all…? Unplug all your USB devices, turn the computer off (don’t just reboot), and turn it on again. Drove me nuts. I like my Canon LiDE60 scanner, but I recently discovered that it hasn’t been playing well with my Powerbook when I leave the room–a program installed in the background along with the scanner’s drivers will wake up the machine periodically when it tries to go to sleep. Step 1. Go to your main Library folder on your boot drive, and look in CFM Support. Here, I’ve renamed CNQL1212_ButtonManager to old_CNQL1212_ButtonManager. Depending on your system, you may have multiple Button Managers. Do ’em all. Step 3. Reboot and test it out. This trick may not work if you have the scanner attached through a USB hub…your feedback is welcome!